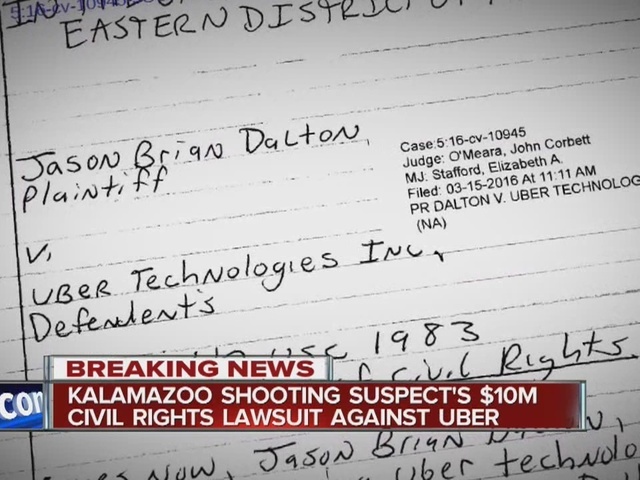 The man accused of shooting people at random in Kalamazoo has filed a federal civil rights lawsuit against Uber, contending they ruined his life. Jason Dalton filed the two page handwritten lawsuit in the United States District Court for the Eastern District of Michigan. According to court records, the envelope that was used to file the lawsuit is postmarked March 11. In the suit, Dalton alleges Uber "ripped me off" and "never paid me back wagers or overtime." He also says "they gave me no Christmas bonus." He also says "I'm currently in prison because of Uber" and that "Uber doesn't care about its Drivers, we are peasants and pawn pieces to Ubers bottom line." Dalton concludes his lawsuit by writing "My life is ruined because of Uber. My wife is Divorcing me because of Uber. I seek $10 million dollars in punitive damages and Emotional distress. I have psychological damage because of Uber." Dalton is currently locked up, facing murder charges. He is accused of shooting 8 people, killing 6 of them, during a shooting spree across Kalamazoo. Prosecutors say he was driving people as an Uber driver during his shooting spree. He has said the Uber app "took him over" during the shooting spree. It's hard to know how to respond to someone who refuses to take responsibility for his own actions. Our hearts go out to the victims' families who have to live with the consequences of his terrible crimes.